The production cycle of Volkswagen's super car Bugatti Veyron 16.4 seems to come to an end. At least some special editions suggest this. Mansory, a tuning company which paid much attention to the car, in the past are now following by their own final offer, limited to one car! So far the Germans added new wheels to it, increased power by a few ponies and replaced some body parts by their own ones - which were made from carbon. Also the cabin got some carbon parts, besides further refinements. Mansory called this composition: Linea Vincero. With the d'Oro option, the line is put to a new level. Wheels, door handles, mirror covers, grille and fuel filler flap are gold-plated. 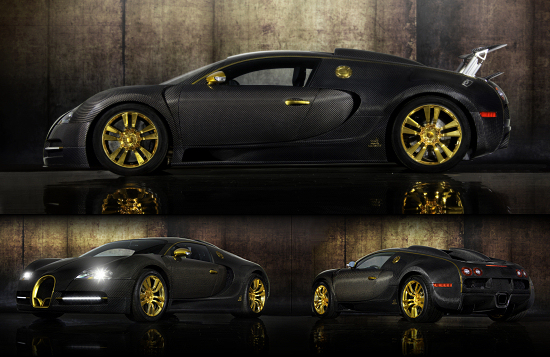 At the cabin, Mansory continues with the combination of gold and carbon, at least optically. An LED light strip cools down the atmosphere inside. Altogether there are lots of contradictions with the conversion. Warm colours and cool illumination, high-tech carbon and classic leather, light carbon and heavy gold – although such plating carry no weight, of course, physically. No matter how one thinks about it, those who have the money and search for something unique but eccentric will find it in the Mansory Linea Vincero d'Oro. But, he should already own a Veyron. Because Mansory just overworks customer's cars. After all this earth-bound rocket is only purchased to selected buyers.